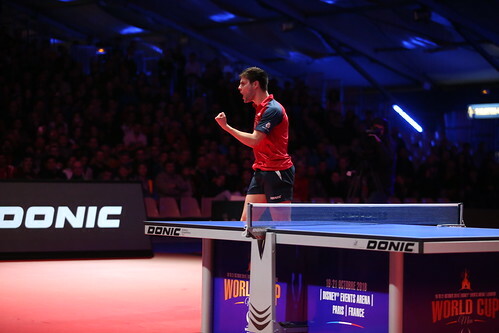 Following a spectacular opening to the show at Disneyland Paris the question was whether Day Two at the Liebherr 2018 ITTF Men’s World Cup could deliver an experience just as exciting as the first, the answer was a big resounding yes as fans witnessed another epic day of elite table tennis action on Saturday 20th October. Right from the word go spectators at the Disney Event Arena were treated to a dramatic contest as Germany’s Dimitrij Ovtcharov played-out a tight Round of 16 encounter with Mattias Falck. Starting the stronger player but soon finding himself 1-2 down, Dimitrij Ovtcharov was pushed right down to the wire with the no.3 seed requiring the full distance (11-5, 4-11, 7-11, 13-11, 11-3, 5-11, 12-10) to avenge the semi-final defeat he suffered against the Swede at the 2016 Swedish Open. Further success followed quickly after for German fans as two-time winner Timo Boll held off a competent display from Emmanuel Lebesson, seeing off the French hopeful across five games (11-8, 8-11, 11-8, 11-5, 11-7). There were more tears shed by the home crowd as the other French star competing in Paris, Simon Gauzy narrowly lost out to Korea Republic’s Lee Sangsu (11-6, 4-11, 6-11, 11-7, 6-11, 11-8, 11-8) but enjoyed his fair-share of spectacular shots including the Point of Day 2 presented by STIGA. Vladi shows he’s still got it! Celebrating his 42nd birthday earlier in the year but Belarusian legend Vladimir Samsonov showed the crowd in Paris that he’s still able to mix it with the best, a lesson Wong Chun Ting learned the hard way! Storming to a three games lead, Vladimir Samsonov held off a late charge from the Hong Kong player to move through to the last eight (11-6, 12-10, 11-9, 7-11, 11-7) and was pleased to be a part of the wonderful atmosphere created by the local fans. Absolutely fantastic atmosphere at the Disney Arena.?? 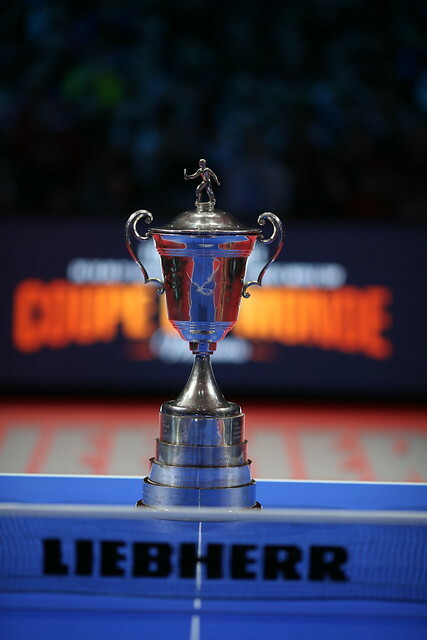 For Japan and China, the news from the Round of 16 was overwhelmingly positive: Tomokazu Harimoto and Koki Niwa, seeded sixth and eighth, chalked up comfortable victories over Jeong Sangeun and Jonathan Groth respectively while Fan Zhendong and Lin Gaoyuan brought Gustavo Tsuboi and Kanak Jha’s impressive runs to an end. Rounding off the day’s programme were four thrilling quarter-final battles, one of which saw Dimitrij Ovtcharov fighting up against the ropes for the second match running. Trailing by two games to three and with the momentum leaning in Lee Sangsu’s direction, defending champion Dimitrij Ovtcharov displayed nerves of steel to claim his second 4-3 victory of the day (11-7, 11-5, 11-13, 9-11, 5-11, 11-5, 11-5). Registering a fine win earlier in the day but at the quarter-finals stage Vladimir Samsonov departed the title race as Fan Zhendong performed on another level (11-3, 11-6, 12-10, 11-6) and after the match there was a nice touch from the Chinese star, who heaped praise on his Belarusian counterpart. Awaiting the top seed in the last four is fellow countryman Lin Gaoyuan following his five games win at the expense of Koki Niwa (12-10, 5-11, 14-12, 11-9, 11-5) while the final fixture of the day saw Timo Boll come out on top against teenage superstar Tomokazu Harimoto (9-11, 11-3, 13-11, 11-5, 11-9).